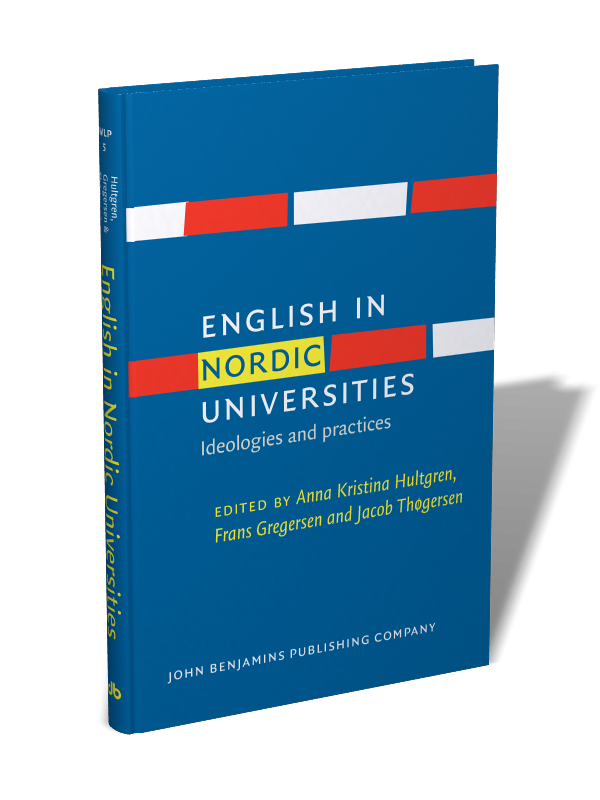 This volume brings together theoretical perspectives and empirical studies on the ongoing Englishization of Nordic universities. A core objective is to contrast and address the gap between ideological representations of this phenomenon and the ways in which it unfolds in the practices on the ground. The book provides perspectives from five Nordic countries: Iceland, Norway, Denmark, Sweden and Finland, with one chapter from each country focusing on ideologies and another on practices. 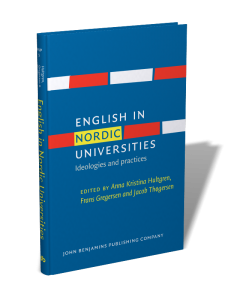 The book is intended to provide an up-to-date resource on the internationalization and Englishization of Nordic universities for scholars, policy makers and anyone wishing to gain an overview of current issues in the field. The symposium consisted of papers, presentations and panel discussions by experts from across the world, with particular emphasis on the Nordic countries and on languages of instruction in higher education. The topic was linked particularly to the coming publication of the book edited by Anna Kristina Hultgren, Frans Gregersen, and Jacob Thøgersen, English in Nordic Universities: Ideology and Practice, to be published in 2014 in the series Studies in World Language Problems, by the publisher John Benjamins, Amsterdam. The symposium was particularly concerned with the expanding use of English-medium instruction in higher education and the repercussions, positive and negative, of this development. The symposium also examined alternative approaches. Although the starting-point was the Nordic countries, contributions on the language-of-instruction situation in higher education in other parts of the world were welcome. The symposium was taking place under the auspices of the Árni Magnússon Institute for Icelandic Studies and the Vigdis Finnbogadóttir Institute for Foreign Languages. Financial support was received from the Esperantic Studies Foundation and from John Benjamins Publishing Company. • Van den Kieboom, Walter. European Esperanto Union. “El español en el campo de las ciencias: propuestas para una política del linguaje”. “Spanish in Science and Higher Education: Perspectives for a Plurilingual Language Policy in the Spanish-speaking World”. “Les langues des sciences et de l’enseignement supérieure”. Posted by Ulrich Lins: DAAD. German as a Language of Science. Tytgat, Kristin: "Language Policy in Flemish Higher Education in Belgium: English in an Academic Context"
Ministry of Education and Science of the Republic of Kazakhstan. National Report on the Status and Development of Education of the Republic of Kazakhstan. English in Scandinavian tertiary education: To take arms against a sea of troubles? La angla en skandinava universitata edukado: Chu sin armi kontrau la tuta maro da mizeroj? Geoffrey Greatrex: The situation in Canada and the U.K.
Usui Hiroyuki: China’s two-fold linguistic policy: English today, Chinese tomorrow? Airey, J. (2003) Teaching university courses through the medium of English: The current state of the art. In G. Fransson, Å. Morberg, R. Nilsson & B. Schüllerqvist (Eds. ), Didaktikens mångfald, Lärarutbildningens skriftserie 1 (pp.11-18). Gävle: Högskolan i Gävle. Airey, J. (2004) Can you teach it in English? Aspects of the language choice debate in Swedish higher education. In R. Wilkinson (Ed. ), Integrating content and language: Meeting the challenge of a multilingual higher education (pp. 97-108). Maastricht, Netherlands: Maastricht University Press. Altbach, P. G. & Knight, J. (2007) The internationalization of higher education: Motivations and realities.Journal of Studies in International Education, 11(3), 290-305. Ammon, U. (1995) To what extent is German an international language? Sociolinguistic, cultural, and pragmatic perspectives on contemporary German. In P. Stevenson (Ed. ), The German language and the real world (pp. 25-53). Oxford: Oxford University Press. Ammon, U. (1998) Ist Deutsch noch internationale Wissenschaftssprache? Englisch auch für die Lehre an den deutschsprachigen Hochshculen. Berlin: De Gruyter. Ammon, U. (2001) English as a future language of teaching at German universities? A question of difficult consequences, posed by the decline of German as a language of science. In U. Ammon (Ed. ), The dominance of English as a language of science: Effects on other languages and language communities(pp. 343-362). Berlin: Mouton De Gruyter. Ammon, U. (2004) German as an international language of sciences: Recent past and present. In A. Gardt & B. Hüppauf (Eds. ), Globalization and the future of German (pp. 157-172). Berlin: Mouton de Gruyter. Ammon, U. & McConnell, G. (2002) English as an academic language in Europe: A survey of its use in teaching. Bern: Peter Lang. Benedictus-van den Berg, Saskia, & Alex Riemersma (Eds.). (2013). Higher Education and Research on Multilingualism – Challenge or Opportunity? Special issue of European Journal of Language Policy, 3/2, 135-278. Bergan, Sjur (Ed.) (2002). Language Policies in Higher Education: Invitation to a Debate. Strasbourg: Council of Europe Publishing. Bundesministerium für Bildung und Forschung (BMBF) (2002) Internationalisierung des Studiums: Ausländische Studierende in Deutschland, deutsche Studierende im Ausland. Ergebnisse der 16. Sozialerhebung des Deutschen Studentenwerks (DSW). Bonn: BMBF. Cabau, Béatrice. 2011. Language policy in Swedish higher education: A contextualised perspective.Eyropean Journal of Language Policy. 3/1, 37-60. Canagrajah, S. (2007). Lingua Franca English, multilingual communities, and language acquisition. The Modern Language Journal, 91, 923-940. Coleman, J. A. (2006) English-medium teaching in European higher education. Language Teaching, 39, 1-14. De Schutter, H. (2007) Language policy and political philosophy: on the emerging linguistic justice debate.Language Problems & Language Planning 31.1: 1–23. De Swaan, A. (1998) A political sociology of the world language system: The dynamics of language spread. Language Problems and Language Planning, 22, 63-73. Doiz, Aintzane, David Lasagabaster & Juan Manuel Sierra, ed. (2012) English-medium instruction at Universities: Global challenges. Clevedon: Multilingual Matters. Erling, E. J. (2007) Local identities, global connections: Affinities to English among students at the Freie Universität Berlin. World Englishes, 26(2), 111-130. Erling, E. J. & Hilgendorf, S. K. (2006) Language policies in the context of German higher education.Language Policy, 5, 267-292. Fettes, M. (1997) Language planning and education. In R. Wodak & D. Corson (Eds. ), Encyclopaedia of language and education: Language policy and political issues in education Vol 1 (pp. 13-22). London: Kluwer Academic Publishers. Fiedler, S. (2010) The English-as-a-lingua-franca approach. Linguistic fair play? Language Problems & Language Planning 34.3: 201–21. Fligstein, N. 2008. Euroclash: The EU, European Identity, and the Future of Europe. Oxford: Oxford University Press. García, O. (Ed.) 2008. International Multilingual Research Journal, 2(1/2), Summer 2008. (Special section on Spanish as a Global Language). García, O. (Ed.) 2009. Bilingual Education in the 21st Century: A Global Perspective. Oxford: Wiley-Blackwell. Gardt, A. & Hüppauf, B. (2004). Globalization and the future of German. Berlin: Mouton de Gruyter. Gazzola, Michele, & François Grin (2013). Is ELF more effective and fair than translation? An evaluation of the EU’s multilingual regime. International Journal of Applied Linguistics 23/1:93-107. Gazzola, M. (2006) Managing multilingualism in the European Union: language policy evaluation for the European Parliament. Language Policy 5.4: 393–417. Gazzola, M. (2012) The linguistic implications of academic performance indicators: General trends and case study. IJSL 216:131-156. Gottlieb, N. (2012). Language Policy in Japan: The challenge of change. Cambridge: Cambridge University Press. Grin, F. (2001) English as an economic value: facts and fallacies. World Englishes 20.1: 65–78. — (2004a) L’anglais comme lingua franca: questions de coût et d’équité. Commentaire sur l’article de Philippe Van Parijs. Économie publique 15.2: 33–41. —(2008) Principles of policy evaluation and their application to multilingualism in the European Union. In X. Arzoz (ed. ), Respecting linguistic diversity in the European Union. Amsterdam: Benjamins. 73–83. Grin, F. (2013) L’anglais dans l’enseignement académique: le débat s’egare dans les clichés. Le Temps (Genève) 13 June. Graddol, D. (2003) The decline of the native speaker. In G. Anderman & M. Rogers (Eds. ), Translation today: Trends and perspectives (pp. 152-167). Clevedon: Multilingual Matters. Haberland, Hartmut (2011) Local languages as the languages of internationalization: Internationalization and language choice. Intercultural Communication Review 9:37-47. Haberland, Hartmut (2009) English – the language of globalism? Rask 30:17-45. Available athttp://akira.ruc.dk/~hartmut/English.pdf. Haberland, Hartmut & Klaus Schulte (2008) Deutsch als Wissenschaftssprache. In Michael Svendsen Pedersen & Hartmut Haberland (Eds. ), Sprogliv – Sprachleben. Festschrift für Karen Sonne Jakobsen.Roskilde: Roskilde Universitetscenter, Institut for Sprog og Kultur, 123-134. Hamel, Rainer Enrique. (2006) Spanish in science and higher education: Perspectives for a plurilingual language policy in the Spanish speaking world. Current Issues in Language Planning, 7, 1, 95–125.www.hamel.com.mx. Hamel, R. E. (2007) The dominance of English in the international scientific periodical literature and the future of language use in science. AILA Review, 20, 53–71. www.hamel.com.mx. Harder, P., ed. (2009) English in Denmark: Language Policy, Internationalization and University Teaching. Special edition of Angles on the English-Speaking World, Vol. 9. Copenhagen: Museum Tusculanum Press. Heller, M. (2010) The commodification of language. Annual Review of Anthropology, 39, 101-114. Hellmann, J. & Pätzold, M. (2005) Internationale Studiengänge: Wer braucht so etwas? Überlegungen zu einem Trend, der sich fortsetzen wird. In M. Motz (Ed. ), Englisch oder Deutsch in Internationalen Studiengängen? (pp. 17-30). Frankfurt am Main: Peter Lang. Hilgendorf, S. K. (2005) "Brain gain statt [instead of] brain drain": The role of English in German education.World Englishes, 24(1), 53-67. Hilgendorf, S. K. (2007) English in Germany: Contact, spread and attitudes. World Englishes, 26(2), 131-148. Hoffmann, C. (2000) The spread of English and the growth of multilingualism with English in Europe. In J. Cenoz & U. Jessner (Eds. ), English in Europe - Acquisition of a third language. Clevedon: Multilingual Matters. House, J. (2005) Englisch als Lingua Franca: eine Bedrohung für die deutsche Sprache. In M. Motz (Ed. ),Englisch oder Deutsch in Internationalen Studiengängen. Frankfurt am Main: Peter Lang. Hughes, R. (2008) Internationalisation of higher education and language policy questions: Questions of quality and equity. Higher Education Management and Policy, 20(1), 111-128. Hult, F. M. (2005) A case of prestige and status planning: Swedish and English in Sweden. Current Issues in Language Planning, 6(1), 73-79. Kimura, Goro Christoph, ed. (2008) Al justa lingvopolitiko en Azio. Towards Equitable Language Policy in Asia. Tokyo: European Institute, Sophia University. Kristinsson, Ari Páll & Amanda Hilmarsson-Dunn (2012) Unequal language rights in the Nordic language community. Language Problems & Language Planning, 36/3:222-236. Kruseman, A. N. (2003) Preface. In C. Van Leuwen & R. Wilkinson (Eds. ), Multilingual approaches in university education. Maastricht: Universiteit Maastricht Uitgeverij Valkhof Pers. Kurtán, Z. (2004) Foreign-language-medium instruction in Hungarian higher education. In R. Wilkinson (Ed. ), Integrating content and language: Meeting the challenge of a multilingual higher education. Maastricht: Maastricht University Press. Maiworm, F. & Wächter, B. (2002) English-language-taught degreeprogrammes in European higher education: Trends and success factors. Bonn: Lemmens. Kuteeva, M. (2011) Editorial: Teaching and learning in English in parallel-language and ELF settings: debates, concerns and realities in higher education. Ibérica 22: 5-12. Lacey, Joseph. (2013) Considerations on English as a global lingua franca. Political Studies Review: 2013.1-10. Lauridsen, Karen M. (2013) Higher education language policy: Report of the CEL/ELC Working Group.European Journal of Language Policy 5/1:128-138. Li, D. C.-S. (2012) Book review of [Harder, ed. 2009]. International Journal of Sociology of Language216:199-204. Lin, A, & Martin, P. (2005). Decolonization, Globalization: Language-in-education policy and practice. Clevedon: Multilingual Mattes. Lo Bianco, J., Orton, J. & Gao, Y (Eds.) (2009) China and English: Globalisation and the Dilemmas of Identity. Bristol: Multilingual Matters. Maiworm, F. & Wächter, B. (2008) English-language-taught degree programmes in European higher education: The picture in 2007. Bonn: Lemmens. Maurais, J., & Morris, M. A. (Eds.). (2003). Languages in a Globalizing world. Cambridge: Cambridge University Press. McKay, S., & Bokhorst-Heng, W. D. (2008). International English in Its Sociolinguistic Contexts: Towards a socially sensitive pedagogy. NY: Routledge. Mesthrie, M. (2008). Death of the mother tongue – Is English a glottophagic language in South Africa? English Today, 94(2):13-19. Meyer, H. J. (2004) Global English: A new lingua franca or a new imperial culture? In A. Gardt & B. Hüppauf (Eds. ), Globalization and the future of German. Berlin: Mouton de Gruyter. Motz, M. (2005) Englisch oder Deutsch in Internationalen Studiengängen? Frankfurt am Main: Peter Lang. Mortensen, J. and H. Haberland (2012) English – the new Latin of academia? Danish universities as a case. International Journal of the Sociology of Language 216, 175-197. Nastansky, H. L. (2004) National strategy in the internationalisation of higher education: A German persective. In R. Wilkinson (Ed. ), Integrating content and language. Meeting the challenge of a multilingual higher education (pp. 49-54). Maastricht: Maastricht University Press. Oberreuter, H., and others (Eds.) (2012) Deutsch in der Wissenschaft: Ein politischer und wissenschaftlicher Diskurs. München: Olzog. Phillipson, Robert (2003) English-only Europe? Challenging language policy. London: Routledge. Oukhiar, Fouad. 2010. The impact of international cooperation on educational language policy: A case in Spain. European Journal of Language Policy 2/1, 41-56. Phillipson, Robert (2004) Ĉu nur-angla Eŭropo? Defio al lingva politiko. Trans István Ertl. Rotterdam: UEA. Phillipson, R. and Skutnabb-Kangas, T. (1999). Englishisation: one dimension of globalisation. In D. Graddol & U. H. Meinhof eds. English in a changing world – L’anglais dans un monde changeant. AILA review 13:19-36. Pietiläinen, Jukka (2011). Public opinion on useful languages in Europe. European Journal of Language Policy 3/1, 1-14. Rahman, T. (2009) Language ideology, identity and the commodification of language in the call centres of Pakistan. Language in Society, 39, 233-258. Sercu, L. (2004) The introduction of English-medium instruction in universities. A comparison of Flemish lecturers’ and students’ learning skills, perceptions and attitudes. In R. Wilkinson (Ed. ), Integrating content and language: Meeting the challenge of a multilingual higher education (pp. 547-555). Maastricht: Maastricht University Press. Rassool, N. (2007). Global Issues in Language, Education and Development: Perspectives from postcolonial countries. Clevedon, UK: Multilingual Matters. Seidlhofer, B., A. Breiteneder and M.-L. Pitzl. (2006). English as a lingua feranca in Europe: Challenges for applied linguistics. Annual Review of Applied Linguistics 26/1:3-34. Serra, Cecilia. 2011. Représentations sociales du plurilinguisme et des enseignements plurilingues à l’université, dans les politiques linguistiques et les discours des enseignants. European Journal of Language Policy 3/2, 215-236. Tam, K., & Weiss, T. (2004). English and Globalization: Perspectives from Hong Kong and Mainland China. Hong Kong: The Chinese University of Hong Kong. Tollefson, J.A., & Tsui, A.B.M. (Eds.) (2006). Language Policy, Culture, and Identity in Asian Contexts.Lawrence Erlbaum Associates. Tonkin, Humphrey (2007) Exclusion and Inclusion in Europe: The Search for a European Language Policy. In Pol Cuvelier, Theodorus du Plessis, Michael Meeuwis & Lut Teck (Eds.) Multilingualism and Exclusion: Policy, Practice and Prospects. Pretoria: Van Schaik. 207-223. Tonkin, Humphrey (2011) Language and the ingenuity gap in science. Critical Inquiry in Language Studies. 8/1:105-116. Tonkin, H., & Reagan, T. (Eds.). (2003). Language in the Twenty-first Century. Amsterdam: John Benjamins. Verbik, L. & Lasanowski, V. (2007) International student mobility: Patterns and trends. London: Observatory on Borderless Higher Education (OBHE). Van Oostendorp, Marc (2012) Bilingualism versus multilingualism in the Netherlands. Language Problems & Language Planning, 36/3:252-272. Van Parijs, Philippe. 2011. Linguistic Justice for Europe and the World. Oxford: Oxford University Press. Viereck, W. (1996) English in Europe: Its nativisation and use as a lingua franca, with special reference to German speaking countries. In R. Hartmann (Ed. ), The English Language in Europe (pp. 16-23). Exeter: Intellect. Walkenhorst, H. (2005) Europeanisation of the german education system. German Politics, 14(4), 470-486. Walker, Alastair. (2011). Multilingualism, the university department and minority languages. European Journal of Language Policy 3/2, 175-196. Wickström, Bengt-Arne. (2007). Fairness, rights, and language rights: On the fair treatment of linguistic minorities. In P. Baake and R. Borck (Eds,), Public economics and public choice. Berlin: Springer, 81-102. Wiley, T.G. & Artiles, A. (Eds.) (2007). Special Issue on English and Globalization. International Multilingual Research Journal 1(2). Wright, Sue. 2010. The elephant in the room: Language issues in the European Union. European Journal of Language Policy 1/2:93-120.